Lord Fang fled and the victorious Guild threw their Heroes a party (and let the losers attend to drown their sorrows). The party went long. Perhaps, a bit too long. For, when they all awoke after a drink or ten, they’d been banished! The sun was gone once more! And monsters stood on the walls and jeered. The Nameless' plan was simple: drug the enemy with strong spirits and bedazzle them with festive party favors. The Nameless’s mighty horde descended from the mountains and piled the snoozing heroes beyond the gates. Eternal Night fell once again! Now, in this darker time within the darkest time, the heroes must face this despicable Nameless Threat in yet another Arcadia Quest! For all of you fans of Arcadia Quest, (like myself) who have played the base game, and are now looking to expand on your experience and add a whole new campaign via expansion, don’t look here first! This was a kickstarter stretch goal, and hard to come by. The Beyond the Grave expansion is your best bet if you do not own that already. Sadly, to a lot of us, we did not know of this great game during its Kickstarter campaign, which was one of the only ways to get your hands on this extra content. Luckily enough, “Cool Mini Or Not” had a booth at PAX East 2015, and upon purchase of other “CMON” games and merch, (Zombicide, Kaos Ball, Dogs of War, Rivet Wars) you could choose through promotional Kickstarter items for whichever game you wished. As far as i know, it was explained that they would continue this limited-release at major gaming cons and functions that they attended, but did not say if they would re-release to the mass public later down the line. – 25 new heroes to play as, 1 of which is Chooloo who also has a separate miniature and cards for being an enemy. – 6 other new enemy miniatures that are added as the main evil-doers of the expansion. – Upgraded wound, death,and guild markers which are much nicer to handle over the cardboard punch-outs. – 1 Campaign book for The Nameless campaign. Notice how I didn’t say NEW campaign book for the nameless campaign? That’s because the book that came with this expansion is the base game campaign with the new Evil Guild called “the Nameless” overlay-ed into the story-line. The man at Cool Mini Or Not also stated that they DO have PDF printouts of missions for Arcadia Quest on their site, but I haven’t validated that info yet. Overall it is definitely worth the money for this expansion for the new characters and tokens that will “****” your set of Arcadia Quest and easily add a lot of replay value to an already vast and versatile dungeon crawl that offers the character building progression, which a lot of RPG-ers will like. 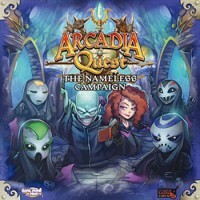 Add a Review for "Arcadia Quest: The Nameless Campaign"